Global pharmaceutical plants turnkey supplier, Iven specializes in IV solution turnkey project & lifelong after-sales service. The highlights of the design proposal are not prominent, the layout is unreasonable. The deepen design is not standardized, the implementation is difficult. The progress of the design program is out of control, the construction schedule is endless. As a professional team has more than 10 years experiences and accumulated resources in the Pharmaceutical industry, the vast majority of procurement of products are good quality, Competitive price, high cost effective and profitable. In five Central Asian countries, most of pharmaceutical products are imported from foreign countries, not mention to injection infusion. After several years of hard work, we have already helped them get out of the trouble one after another. In Kazakhstan, we built a large integration pharmaceutical factory which includes two Soft Bag IV-Solution Production Lines and four Ampoules Injection Production Lines. 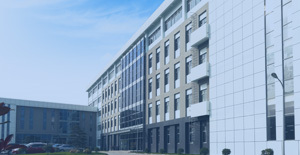 Iven provides integrated engineering solution for worldwide pharmaceutical and medical factory include the clean room, auto-control and monitoring system, pharmaceutical water treatment system, solution preparing and conveying system, filling and packing system, automatic logistics system, quality control system and central laboratory and etc. 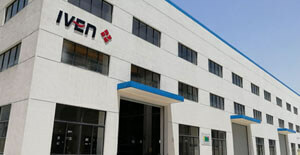 According to the pharmaceutical industry's regulatory requirements of different countries and customer's individual demand, IVEN carefully customizes engineering solutions of turnkey project and help our customers win the high reputation and status in the filed of pharmaceutical industry at home. Application This equipment is mainly used for packaging disposable medical products, such as disposable syringe, needle, infusion set, and medical health consumable. It is also applicable for products such as medicine, food, textiles, daily commodity, stationery, toys and small hardware kind. Features 1. The spacing of the guide columns of the lifting mechanism is increased from 110mm to 300mm, which greatly improves the stability of the heat sealing. 2. The movement of the blister mechanism and the heat sealing mechanism are all driven by a screw rod, it is more convenient to replace the mold. 3. The fixing method of the slitting cutter has been improved to avoid the swinging of the slitting knife during work causes the cutting edge to be bad. 4. The structure is reasonable, and the operating rod is made of aluminum alloy profile, which is beautiful and durable. 5. Brake mechanisms of paper and film adopts a canvas belt holding brake structure to make the paper and film travel more smoothly. Brief Introduction Our Non-PVC soft bag IV solution production line is the latest production line with most advanced technology. It can automatically finish film feeding, printing, bag making, filling and sealing in one machine. This LVP FFS line can be used to automatically fill 50-5000ml general solution, special solution, dialysis solution, Parenteral nutrition, Antibiotics, Irrigation and Disinfectant solution etc. It can supply you different PP bag design with single boat type port, single/double hard ports, double soft tube ports etc. Main features: 1.100% film utilization: No waste edge between bags, reducing both material and energy consumption. 2.Special IV bag design: each bag saves 10mm film than others. 3.Reliable heating and welding system: Leakage rate less than 0.03%. 4.Quick changeover: 0.5-1 hour to switch from one size to another. 5.Stable transmission system: only needs 1 control system, 1 HMI and 1 operator. 6.Safe filling nozzle: No solution overflows, no particles generation. 7.Auto faulty rejection system detected by the machine. 8.Production line length is reduced by 1/3, both workshop and air conditioning and cleaning area are reduced by 1/3, greatly reducing the initial investment and future running cost. 9.Simple structure, more stable and reliable performance. 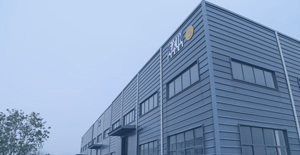 Brief Introduction BXAZ ampoule cleaning, drying, filling and sealing compact production line is a new type of ampoule production line which adopted the advanced international technology, combined several FE Pharmatech’s patents and according to the domestic ampoule production situation. This line is composed by CLQ vertical ultrasonic cleaning machine, RSM sterilizing drying machine and AGF filling and sealing machine. 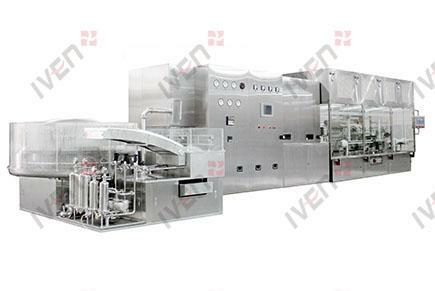 It is divided into cleaning zone, sterilizing zone, filling and sealing zone. This compact line can work together as well as independently. Main Features 1The compact line realizes single linkage, continuous operation from washing, sterilizing，filling and sealing. 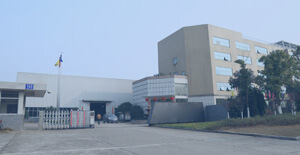 The whole production process realizes cleaning operation; protects products from contamination, meets the GMP production standard. 2 This line adopts water and compressed air cross pressure jet wash and ultrasonic wash at inverted state. The cleaning effect is very good. 3 The ultra filtration technology is applied at the washing machine’s filter. The clean and sterile washing water and compressed air is obtained through terminal filter, which can improve the clarity of the washed bottle. 4 Bottle infeed auger and star wheel meet, the auger space is small. Ampoules can walk straight. Ampoules can transfer more stable and can hardly broken. 5 Double tank and double circulation. The circulation water tank and rough wash water tank are totally separate. The cleaning water is used step by step. The cleaning effect is much better. 6 The stainless manipulators are one side fix. The location is more accuracy. The manipulators are wearproof. When changing of pitch the manipulators no need stretch out and turn. The turning bearing wont contaminating the cleaning water. 7 The ampoules are sterilized by the hot air laminar flow sterilization principle. The heat distribution is more even. The ampoules are under the HDC high temperature sterilization condition, which meets the standard of GMP. 8 This equipment adopts negative pressure sealing principle to seal the high efficiency filter which are used for purify the tunnel. The filter is easy to install which can ensure the one hundred purification condition. 9 The equipment adopts hinge type seat heat and horizontal hot air fan structure. The maintenance of the equipment is more convenient and laborsaving. 10 This equipment adopts chain conveying belt with flank. The conveying belt won’t be off track, anticreeper, no bottle falling. 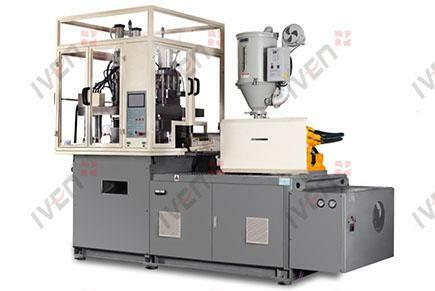 11 The equipment adopts advance technology such as multi-needle filling, front and rear nitrogen charging and wire drawing sealing, which can meet the standard of different type of products. 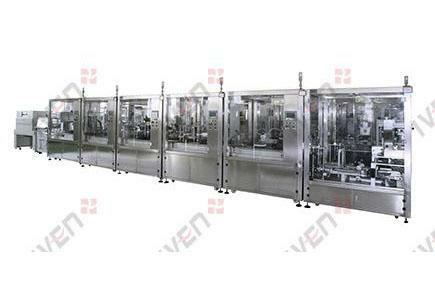 12 The fill-seal machine adopts balcony structure. The starwheel infeed and convey bottles continuously, the running of the equipment is stable and less bottle breakage. 13 This equipment is universal. It can’t be used to 1-20ml ampoules. Changing parts are convenient. In the meantime, the equipment can be used as vial washing, filling and capping compact line by changing some mould and outfeed wheel. Main application This unit is made up of CLQ Ultrasonic Vertical Washing Machine, RSM Sterilizing & Drying Machine and KGYX Filling & Sealing Machine. Divided into three working areas of washing, sterilizing & drying and filling & sealing. It can be either used in-line or in the form of three single machines. Can automatically finish the processes of water spaying, ultrasonic wave washing, compressed air blowing, recycling water flushing, compressed air blowing, fresh high-temperature sterilizing, cooling, bottle-collating, filling, cap-collating, stopppering, panel mounting and so on for vials. Can be equipped with Servo-motor , more stability and accuracy. 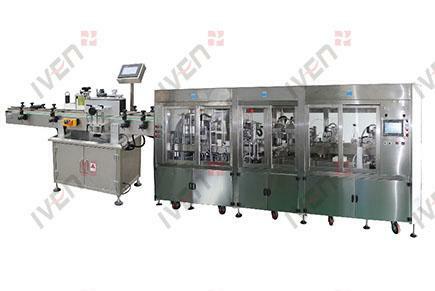 Brief Introduction Glass bottle IV solution production line is mainly used for IV solution glass bottle of 50ml~500ml cleaning, filling, stoppering, capping etc. It can be used for the production of glucose, antibiotic, amino acid, fat emulsion, nutrient solution and biological agents and other liquids etc. Main Features 1. 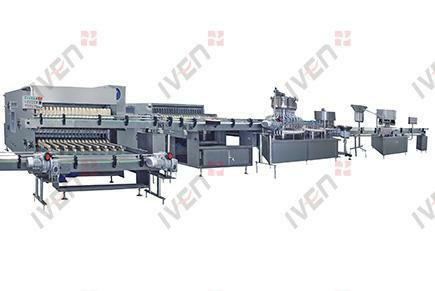 Bottle washing machine adopts new design, rough cleaning adopts the same direction for bottle input and output, saving operators and machine space. 2. Bottle output from rough and fine washing machine adopts twice bottle receiving, avoiding bottle reversal and broken. 3. Bottle washing machine uses intermittent rinsing, avoiding cross contamination caused by continuous rinsing. 4. Bottle input adopts the combination of bottle hook and guide plate, making the bottle input reliable and no bottle reversal. 5. Washing water can be recycled and filtered, reduce water consumption. 6. Filling adopts time and constant current theory; filling quantity can be adjusted by computer with high accuracy. 7. No bottle no filling, can realize CIP/SIP. Brief introduction & Advantage The whole production line is connected by several individual but attachable function modular. Improving traditional process and realizing humanized design of online gel adding . Each modular is controlled by its own PLC, only 3 skilled workers are needed for the whole line to reach 12000-15000pcs/h capacity. No human operation online, decreasing error caused by human difference between batches, which improves production efficiency and products quality. Production Procedures Schematic Diagram Tube Loading Station: Automatic loading through 2 molds base simultaneously. 20 tubes are loaded for one time. With the function of multi-aspect detection including stuck tube, missing tube, and reversed tube. Dosing Station: Adopting FMI metering pump, precision ceramic injection pump with highly atomized nozzle achieves accurate dosing and high stability by easy operation. 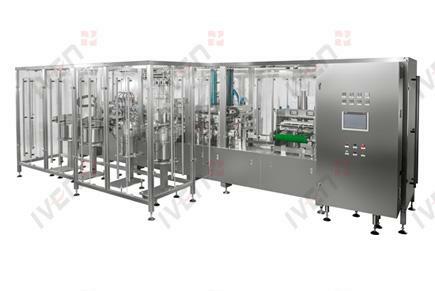 Dosing value could be set on the touchscreen (FMI for metering) Drying Station: 4 sets of drying system adopting PTC heating method bring no pollution to the inside of tubes and achieve high efficiency of drying and production. There has correct positioning device inside of hot rod and tubes to prevent damage of tubes from hot rod. The system can be selectively opened according to production requirement. Capping Station: Increase the buffer zone of cap, and with unique device of cap fetching and distance adjusting, it rises the success rate and stability of capping. Vacuuming Station: With high precision digital-beginning detection for detecting, Panasonic controlling device, unique tamponade device and adopting high efficiency vacuum pump for vacuuming nterlaced Tray Loading: Newest technical device with the function of interlaced loading and distance adjusting. Simply adjust the distance and load. No need another changing step. Positioning rod for cap loading to prevent tray being injured caused by tube tilted. Applied to both type of the rectangular and interlaced. 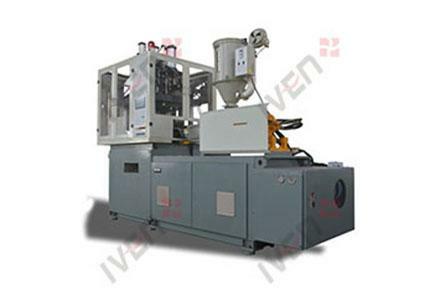 Brief Introduction GZ-SS400-TI injection stretch blow molding machine has 3 stations of injection, stretching & blowing, and products demoulding, the products it produces get one-step formed from raw material to finished products. It can produce many kinds of containers, like IV solution bottle, oral liquid bottle, liquid medicine bottle, tablet bottle, capsule bottle, LED lamp cover, cosmetics bottle, detergent bottle, collutory bottle, milk bottle, condiment container, salad dressing container, drinking water bottle and etc. Main Features 1.Need no heating, reducing molding cycle and energy consumption. 2.Avoid possible pollution from preform station to blow station. 3.Easy replacement of the mold. 4.Apply to many kinds of materials: PC, PET, PP, HDPE, PS etc. 5.Apply to different container shapes: round, non-round, wild-mouth bottle, oval. Brief Introduction GZ-SS400-FI injection stretch blow molding machine has 4 stations of injection moulding, temperature controlling, stretching & blowing, and product demoulding, the products it produces get one-step formed from raw material to finished products. It can produce many kinds of containers, like IV solution bottle, oral liquid bottle, liquid medicine bottle, tablet bottle, capsule bottle, LED lamp cover, cosmetics bottle, detergent bottle, collutory bottle, milk bottle, condiment container, salad dressing container, drinking water bottle and etc. Main Features 1.Need no reheating, reducing molding cycle and energy consumption. 2.Avoid possible pollution from preform station to blow station. 3.Easy replacement of the mold. 4.Apply to many kinds of materials: PC, PET, PP, HDPE, PS etc. 5.Apply to different container shapes: round, non-round, wild-mouth bottle, oval. 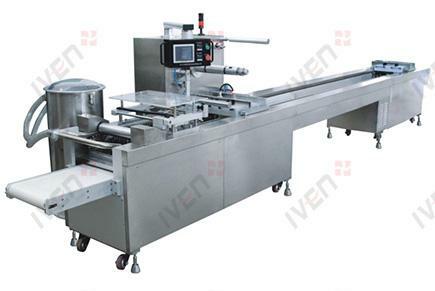 Brief introduction & Advantage Tail-labeling machine connected online, non-label tube to be auto detected by world leading image technology after stoppering & capping and vacuuming (including rift of stopper or cap or glass tube, foreign matter inside tube, no additive, less additive and etc.). Conform tube move to labeling machine, non-conform tube to be rejected. Manual inspection-free technology is world leading. 1. Save labor cost: Other company’s production line need large manual inspection for each tube, include label, dosing, foreign matters inside tube and etc. Our line using world leading image technology to reject non-conform tube (include rift of stopper or cap or glass tube, foreign matter inside tube, no additive, less additive and etc. ), reach 100% accuracy rate. 2. Reduce secondary pollution. Decrease tube multiple exposure, better guarantee tube aseptic. Glass tube after high temp sterilizing. (PET tube produced in Class 100,000 clean room workshop), worker only contact tube one time when loading tubes into auto loading machine, ensure tube cleanness during production in Class 10,000 clean room workshop. 3. Testing qualified products for automatic labeling, ensure packaging sequence according to Barcode Numbers. Packaging sequence according to Barcode Numbers can be up to export standard and usage requirements of large hospitals. 4. Auto inspection device rejects labeled tube if no label. Slanting label, poor adhesive label and etc., ensure labeled tube and finished tube with pass rate 100%. 5. Labeling speed matches the auto assembly line speed well to ensure whole line production capacity get 18000~24000pcs/h 6. The whole line only needs 3 skilled workers. Only manual tube loading at the very beginning, online image and labeling inspection rejects non-conform tubes automatically to ensure 100% pass rate. Save at least 15 workers to get production capacity of 18000~24000pcs/h. 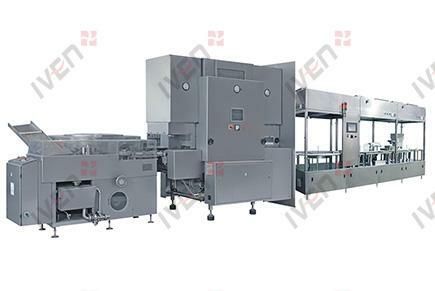 Production Procedures Schematic Diagram Aseptic Environment: equipped with clean laminar flow hood and adopt with high-powered fan and HEPA, it can be operated in long term under high static pressure and keep low noise. The space cleanness can up to class 10,000 (can be optional), which is the exclusive technology in China. Tube loading: adopting with automatic tube loading technology, loading the tube into clamps automatically with detector for no tube or inverse direction tube. The machine apply for any kind of label tubes and solve the defect of the avo label broken of traditional tube loading machine from other manufacturers. Atomization Dosing: The machine adopts with a set of 5 FMI precision ceramic metering pump and 1 set of five conjoined of micro - ceramic injection pump that can dose separately for biochemical tube and anticoagulant tube (EDTA salts, heparin salt); Another set of metering pump is dosing for sodium citrate tubes. Dosing volume controlled by PLC touch screen(see parameter), the error rate is ≦ 5%, and detect for no dosing tubes during the dosing process. Compared with other companies’ machine rely on stable air supply for dosing, our technology of dosing volume will not be influenced by any factors. 3 sets of dosing system meet all kinds of blood collection tubes production, that is the exclusive and advanced technology in China. Drying: Adopting with six sets of dust-free PTC heating dryer to make the inner of products with zero pollution so as to improve the drying effect and production efficiency. Compared with traditional heating method, our machine solves the problem of temperature instability and pollution. Online Stoppering & Capping: finish the combination of stopper & cap online quickly and efficiently (apply for both type: upward and downward), and avoid the nonuniform vacuum degree when dose the tubes after the combination of stopper and cap and it may cause the stopper not seal well against tube. Detect for cap and rubber stopper and avoid the possibility of no stopper or no cap.